Here are a few things in life that I feel provide palpable health benefits (and I tell you this to help you derive the same benefits, as well). Of course, individual circumstances vary, and this is, in no way, meant to be construed as medical advice, nor is it meant to replace the medical care of your own physicians. I do not practice medicine, nor engage in such, so please consult yours before undergoing any new regimens, including changes in diet, exercise, therapies, and the like. Usually, I have found that the products which work best for me generally get removed from the supermarket shelves and are then discontinued. Like…. Lemon-scented Dash. It was a laundry detergent, and it worked superbly. It was given the heave-ho, a long time ago. It’s rumored that manufacturers and drug companies don’t give you the best of, or enough of, whatever product it is that they make, in order to keep the consumer as a continual purchaser of their product. My mother and I have completely different evaluations of products: what works well for me, she doesn’t like; and, what works for her, I don’t like. Nevertheless, since there are a lot of people looking for help, I can only think to help at the moment by providing my own revelations of a few things which I feel really do, and can, help. I know this post is a departure from my normal types of subjects, but in the mode of attempting to assist some of mankind, here I go. Consider it a product review, if you will — even including some foods. Kirkland Signature Daily Multi Vitamins and Minerals. With lycopene and lutein. And calcium… This 500-tablet container, with the blue labeling, costs less than $15.00USD, and it packs a whopping punch. I’ve only once before felt the practically immediate effects of any dietary supplement, and that one was Andersen’s stress tabs, but I haven’t seen them in decades (and I’m not even sure of the correct spelling). I really feel this one working. It is the home-brand of the Costco warehouse-membership bunch, and is available online. Item #416076. July, 2016. Assured (brand) cough drops. These are the Dollar Tree brand of Greenbrier International, and are the mentholated kind, with eucalyptus. These generic items from this dollar store far surpass the name-brand ones. Any time I’m low on supply and I can locate a neaby store, I stock up on the multiple varieties, because they seem to dampen any type of oncoming malaise I might start to feel, whether cold, sorethroat, etc. First of all, they’re the only cough drop I’ve seen which is Kosher. That’s one plus. Frankly, it’s permissible, in many cases if unwell (check with proper authorities), to use medicine that is not Kosher. But, nevertheless, the fact that they do so is awesome. Secondly, they are the only cough drops I’ve seen which also offer sugar-free versions. Thirdly, they have a few flavors: cherry, honey-lemon, and menthol. They all taste very good, and they’re cheap, and work great, in my opinion. Theraflu. This is my favorite cold-fighter. It’s been pulled on and off the shelves, due to health concerns. It disappeared for a long time. It’s now back in many versions. Even if any of the formulas have changed, I still think it works well for me. Contac Cold. This was my long-ago favorite cold “remedy”. I think it has come and gone from the market, and I don’t think it’s newest formulation, if it differs in any respects from its first, is as good as it used to be. 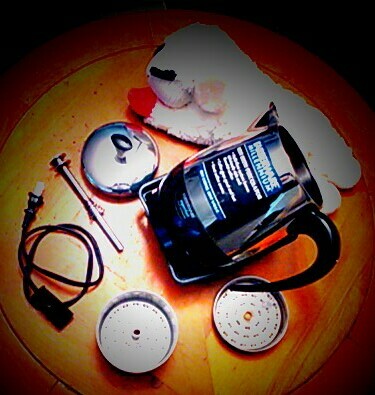 Or, maybe it’s that I found other products to replace it, when this product, itself, was lacking. In any case, it’s now back. Alka-Seltzer Plus. This is my next go-to cold-fighter, if I can’t get to Theraflu, and sometimes by choice. Plop two fizzy tablets, orange-flavored, please, into some warm water, and drink it up! Or down! This works pretty well, too. Mackerel. Seriously. It’s a bit rad for a squeamish person, such as myself, to deal with these things, which are fish, minus the heads and tails, but still with the bones, and stuck into cans and brined. If you think about it, that’s really not appetizing at all. Anyways, I suffer a bit through the episode of deboning, and even eating it, but I find the health benefits incredulous. No kidding. It was an immediate mood-lifter and made me feel super-happy. It also made me feel less achy and more flexible in my joints. All because mackerel are fatty fish which contain Omega 3’s and a little bit of Omega 6’s (acids) which really do hold up the hoopla that’s said about it, as far as what this fish does for me (slip of the finger, I typed “dies” for me… Ughh… Oyyyy…..). Borscht. I feel this just pouring into my cells and somehow making things much better. Buy large fresh beets. Scrub clean and place into pot with water. Cook until soft. Peel skins and discard/compost. Dice beets back into purple water/soup. Let cool. Stir in a large dollop or so of sour cream. It’s probably not the greatest-tasting soup in the world, but it sure helps make you feel healthier. A woman of lofty thoughts and soaring prose, the Isolated Girl living in the land of mountainous vistas reaches new peaks with her poetry and embodies the utmost of sweetness and care in her personal contacts with her community of fellow poets. Jyotee and I go back for awhile, engaging in extended online conversations about anything and everything. I enjoy her unique form of speech and hope that you’ll discover the special qualities I’ve found when you chance to meet. I hope she’ll belong to us, as much as she belongs to Nepal. Thank you, Jyotee, for your voice ringing out from the mountains and for your voice of support in my nomination; I really appreciate that. You are truly a sweet person. Jyotee endowed my second Liebster Award at this site. This award recognizes the contributions of a blogger to the community and is a peer-to-peer acknowledgement of the blogger, for whatever reason deemed appropriate by its endower. The meaning of the award’s Germanic word origin references “Love”. 3. Answer the questions provided by the person who nominated you. 4. Nominate 5-11 blogs that you feel deserve the award, who have less than 1000 followers. You can always ask the blog owner this since not all blogs display a widget that let readers know this information (the new requirements, which seem to have been taken over by theglobalaussie.com, list a 200-follower maximum for 2016. This site name is provided so that you may follow the “official rules” going forward, as best I can tell. The above graphics with the logo I revamped, along with the rules I originally found prior to noting the corrections, are part of my Media Library, and I’ve used them here, applying the old rules). I’ve again restricted, to the best of my knowledge, my choices to those of an adult level. 5. Create a new list of questions for the bloggers to answer. 7. 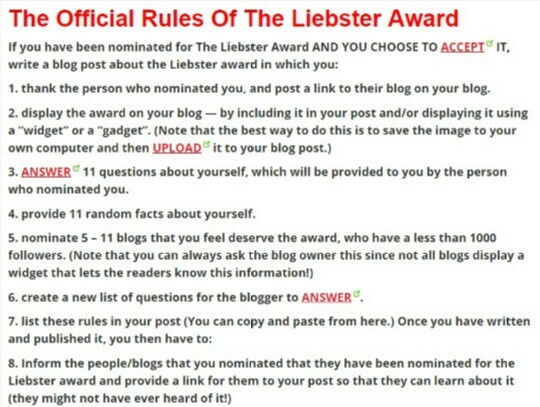 Inform the people/blogs that you nominated them for the Liebster Award, and provide a link for them to your post so that they can learn about it. 8. List 11 random fact about yourself (optional). Q1. What is your First post on WordPress, provide the link? Q2. If you are given a chance to meet people following you in WordPress who would you meet first and why ? A2. It would be really neat to meet you! Anisa said she’d come! But, in all actuality, I have no room for anyone! It’s just cramped and not really a place to have guests — my Mother can’t stay, and not even Kitty, the feral cat, stays… We never had that with the old “masters”; we had to dwell in the mystique and the mystery of imagination, without reconciliation of mismatched expectations. Basically, I’m the country mouse — not the city mouse. Q3. When do you generally write, Morning, Daytime, Evening, Night? A3. My best times involve a confluence of convenience, comfort, mood, inspiration, time, location, appropriate facilitation and motivation. Q4. What is the piece of writing you wrote that is close to your heart? A retrospective collection of poems, photographs, drawings, and selected works reflecting Jewish issues and life generalities. Childhood and aging. On being a parent. A paean to the memories of my Uncle. The physical, metaphorical, and metaphysical aspects of Creation and Mankind. Laid-back Israel vibe versus media accusation. This poem gives you my life’s philosophy, wrapped up in the wisdom of youth. It was published in a nationwide Jewish magazine for children when I was, perhaps, 9 or 10 years old, I’m guessing. A poem written for my Mother. This was a Shakespearean literature class assignment to write a poem based on a potion, as in the witches of Macbeth. This poem is significant to me for several reasons. I had had a creative writer’s block for decades. It took extreme anger and fury to break through it, and this poem was its result. It’s my personal moment of victory — I’d made it through. And we, as the Jewish people, have also done so. This poem was written in a flash, as I watched on television the forced removal of the entire Jewish population from Gaza and in some parts of Judaea/Samaria (the false “West Bank”). I was angered at the obviously apparent anti-Semitic bias of the CNN commentator describing the accompanying visuals of three young girls in long skirts, huddled together quietly as they were being tossed out of their homes, as “Jewish Extremists”. No apologies for our existence need ever be provided. We are that we are. This poem is semi-autobiographical and relates the important concept of the relationship as a meeting of the “we” as a portion of the entity, additional to the “You” and the “I”. Comparative religion, of sorts, from a plucky Jewish girl. This was a Community College writing assignment, which I’d attended, while working, to earn credits toward core college requirements later. The assignment was to describe something without stating what it is. This teacher gave great writing prompts to spur our creativity, and I realize, retrospectively, that I rather enjoyed these classes more than I did at University, where I later transferred. It’s a cheaper method by which to graduate with a degree from University, rather than via the higher costs of a full-fledged same-track education. Triptych; Mixed Media on Paper; At the Kotel HaMa’ariv the “Western Wall” (“The Wailing Wall”) in Jerusalem. Wishful prayers that Jerusalem and peace would be theirs: 1) Christian monk or priest; 2) Jewish woman, symbolically myself, with dove of peace flying; 3) The Hands of G-d, encompassing all Jerusalem and the prayerful. Al-Haram Al-Sharif; Graphic of 1924 booklet from Supreme Moslem Council attesting to Jewish rights over Temple Mount. Take the effort to be helpful in your daily life. Zionism is no modern reality. The basis for the timeline of Zionism and a simple, stark concept. A general reflection on growing up Jewish in America. A lighthearted look at our feline friends. A good peak into the simmering tensions between the French, and the Muslims of northern African countries, such as Tunis and Algeria, gleaned from the self-same titled book, and of which my report is based. How the US government uses taxpayer dollars to fund terrorism against Jews. How the Affordable Care Act (Obamacare) hurts the poorest people it was meant to help. About the division of the Jewish State of Palestine, and commentary from televangelical preachers stoking my ire. An introduction to institutionalized anti-Semitism on American campuses, the worldwide call for Israeli boycott, and a link to an article to better explain why Boycott/Divestment Sanctions (BDS) is really discrimination against Jews. The non-state known as “Palestine”. About the Tsarnaev brothers, the Boston Marathon terrorist bombers. A petition and information on government funding of terrorist groups. A singular celebration of Passover in photos. Q5. What is writing for you? A5. Writing is catharsis, enjoyment, education, entertainment, and enlightenment. Q6. How often do you write ? A6. The blog keeps me seminally bound to writing. It’s good practice toward developing the habit to write on an ongoing, protracted basis, without the pressure of a contract or deadline, but with, at least, a partial expectation toward delivering content for an audience. Q7. If you have to choose between writing and wealth, what would you choose and why ? A7. I’m shooting for both — one as a product of the other, either way around; preferably, in-tandem. Q8. Best and Beautiful thing of your life ? A8. That my birth-mother cared enough to let me reach life and be born into this world. Q9. Source of inspiration for writing ? A9. My mind and life. Nature. Politics. Religion. Irony. Emotions and feelings. Philosophy. Contemplation of the past, the present, and the future. I also love that beautiful brainstorming effect when creative minds click and inspire, such as here, in this forum. Q10. What type of person are you (In five words)? A10. Unusual-thinking, creative, concerned, introspective, corny. Waiting for the answers is the hardest part. And I can’t. So, here are my nominees for the award. 1. What helpful tip would you give to an aspiring writer? 2. What helpful tip would you give to a teen-ager? 3. What helpful tip would you give about the job world? 4. What helpful tip can you give, which applies to life in the household? 5. Who are some of your favorite authors, and which of their writings of note do you particularly enjoy? 6. What are some of the other pursuits you’d like to try? 8. What obstacle have you overcome, and how have you done so? 9. If you could choose to be a color, which would you be, and why? 10. A goal I would like to reach is………..
11. A favorite fable, fairytale or children’s story of mine is……. I like cats. I like dogs. I like cheetahs. I like butterflies. I like dragonflies. I like lions. I like tigers. I like leopards. I like cougars/mountain lions/pumas. I like ladybugs. I like birds. The community we inhabit is a great place to share our ideas, our lives, our hopes, and our dreams with one another as we grow and learn and build and succeed — each with the help and support of each other. Thank you to all. Could you pass the hoe? An important point is made in the following observations regarding the Battle at Wounded Knee and the Pulse terror attack in Orlando, Florida, being described as the worst mass shooting on U.S. soil. In summarizing other’s analyses without being on the scene itself, it is often expected that the resulting report on which is being relied, is also one which is reliable. Journalism, by its very nature, is supposed to be based on facts: the who, what, how, when, which, why, where of the situation — how it happened, how it has unfolded, and how it ended. Unfortunately, this is not always the case. Oftentimes, opinion, hearsay, and repeated mantras wind up to be the story itself, and it is one of the ways in which rumors take on a life of their own, whether true or false. In the case of matters relating to Jewish people, anti-Semitism, and Israel, such stories are oftentimes patently false. Unless someone responds to dispute such accusations, they become almost a matter of public record. The practical aspect of Joseph Goebbels’ disinformation campaigns in his role as head of the Propaganda department of the Nazi regime was to perpetrate a lie of such oft-repeated magnitude that such dogma implanted itself in the minds of the populace through brainwashing. It has done its job when the refutation of the original premise with factual information cannot dislodge the original idea, and even its lie, from the unshakeable, occasionally cult-like, grip on its masses. Please read the informative post found at Humanity Has Hope, a co-productive endeavor made by Jeff, and the contributions to it by Elia. I think you will find it enlightening, as well as informative.